Summertime means Grilling. One of our favorite meals on the grill is Kabobs (or Kebabs – the spellings are interchangeable, seemingly a difference in origin – Arabic, Persian, etc.). They are a party waiting to happen! Dinner on a skewer! 1. It’s a grill-focused meal, which means the heat is out of the kitchen and outside where it belongs! 2. It’s a fun meal to share with guests because people can hang out around the grill tending it while others are in the kitchen getting the rest of the meal ready. 3. 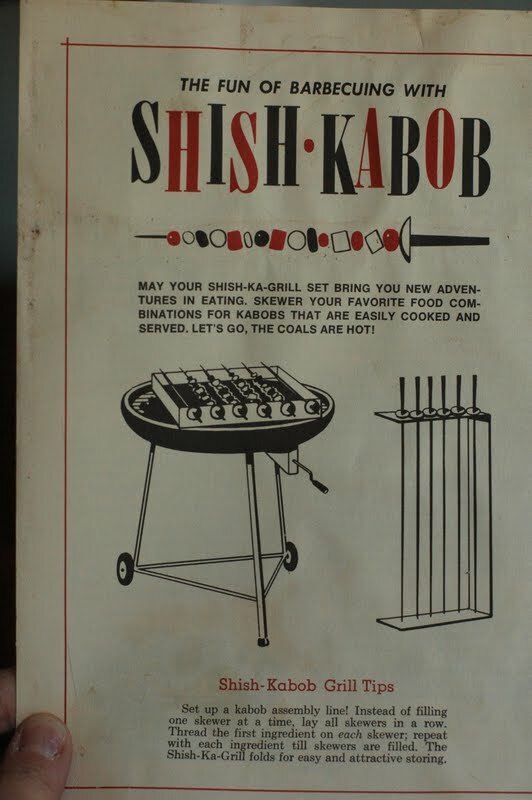 There’s something for everyone with Kabobs! 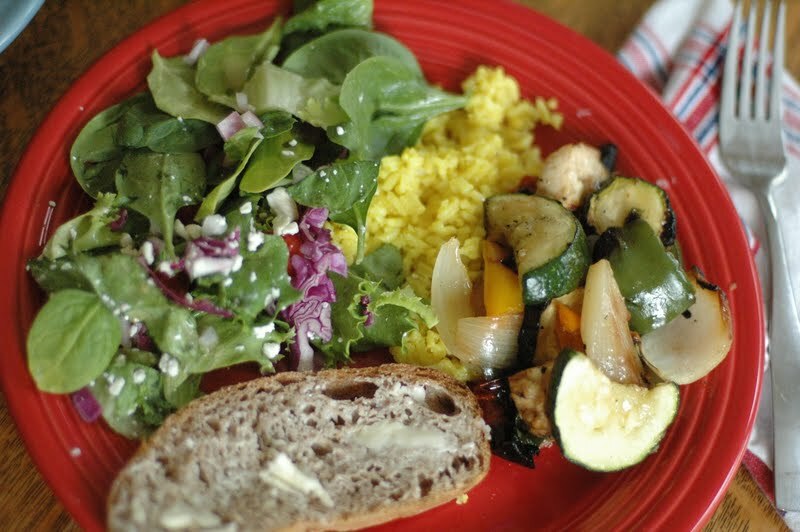 Whether you are a meat-lover or vegetable-lover, it’s a meal for you. 4. 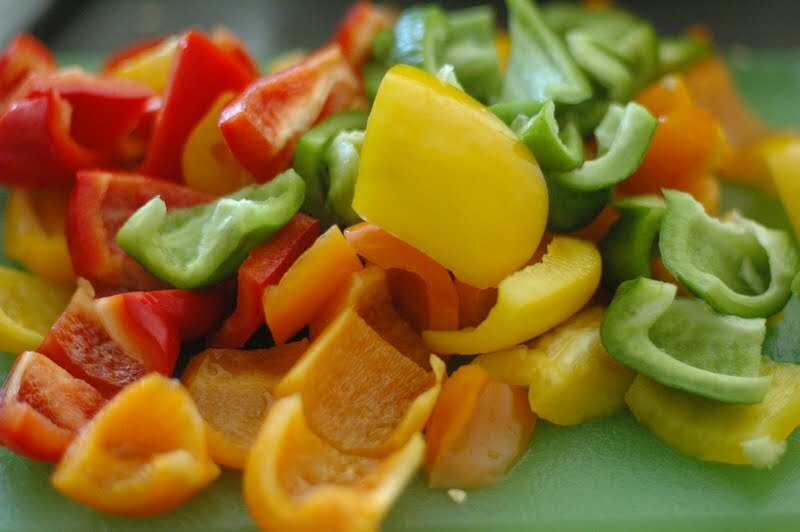 It’s really versatile – you can use any meat (steak, chicken, shrimp, pork) or vegetable (peppers, mushrooms, squash, tomatoes) or fruit that you want to or that you have on hand. 5. It’s healthy and tasty! (Always a winning combination). 6. It’s an easy meal that doesn’t require lots of recipes, just a lot of prepping. 7. Speaking of prepping, it can be done ahead of time (which is always helpful). 8. Different sauces (homemade or purchased) can add a fun zing and variety to the meal – I’ve done Tzatziki Sauce, Satay Sauce, Chipotle Sauce. I have tried different things throughout the years and there are many approaches and options when preparing kabobs. Metal skewers vs. wooden skewers; make your own personal kabob vs. community kabobs; all meat on some skewers/all veggies on the others vs. mixed skewers; to name a few. If you use wooden skewers (which are good if you don’t have enough metal ones or you don’t own any metal ones) it is imperative that you follow the instructions on the package about soaking the skewers before using them on the grill. Trust us, we learned the hard way. The time we tried the “make your own kabob approach” it became a messy, raw-meat, confusing-to-label-situation that we forfeited and made community Kabobs. 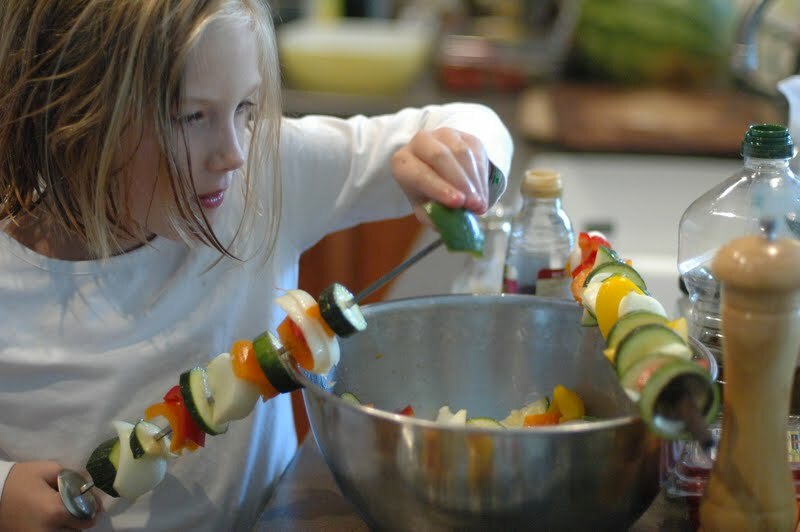 As far as a varied skewer vs. a segregated skewer- the rule of thumb is to put things on the same skewer that will require a similar amount of cooking time. I like to include onion on meaty skewers just to add flavor to the meat, however, many veggies cook at a different rate than meat so we more often segregate the veggies and the meats. According to THE BEST RECIPE: Grilling and Barbecue* cookbook – by the editors of Cooks Illustrated culinary magazine, after laborious research on kabob marinade research, came to the conclusion that an acidic marinade (one with lemon juice or vinegar) was less effective in keeping in the flavor and creating a good texture to the meat than an oil-based marinade. And in order to have the nice flavor of the lemon or lime, the most effective technique is to squeeze it on top of the meat when taking it off of the grill after cooking. So, we followed their recipe and it was very tasty! Stir together ingredients for marinade. 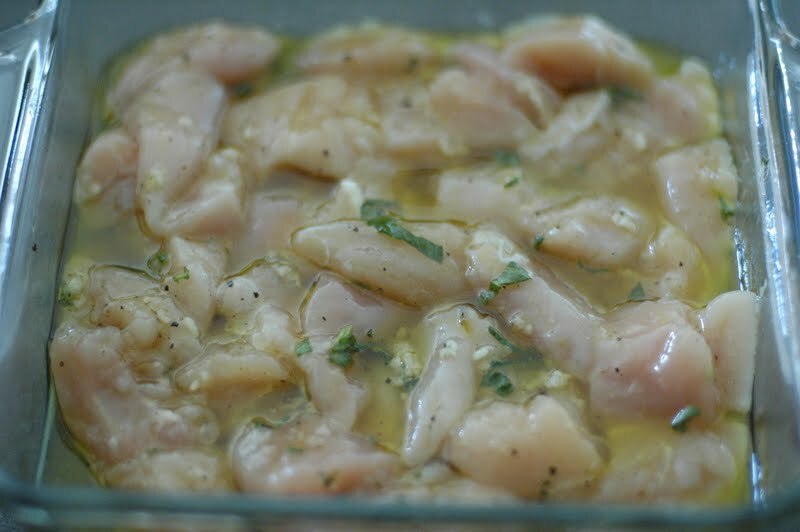 Cover and refrigerate until well seasoned (1 hour or up to 24 hours). 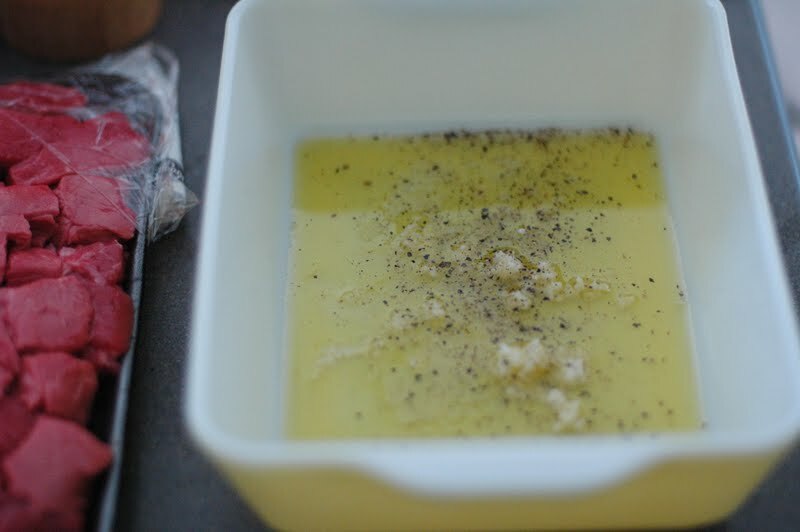 Place in a bowl and toss in a drizzle of olive oil until coated. Season with Kosher Salt and Fresh Ground Pepper. 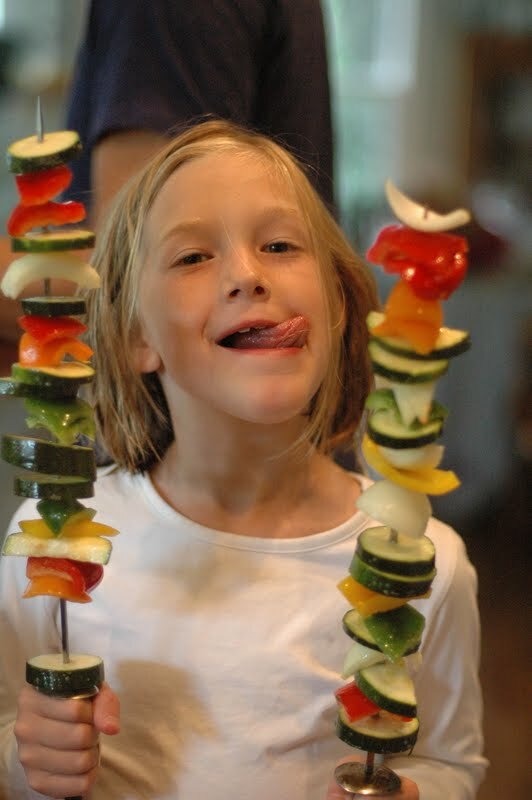 Skewer the Veggies and Meat onto Skewers. Grill until meat is well-browned, grill-marked, and cooked at least 8 minutes. 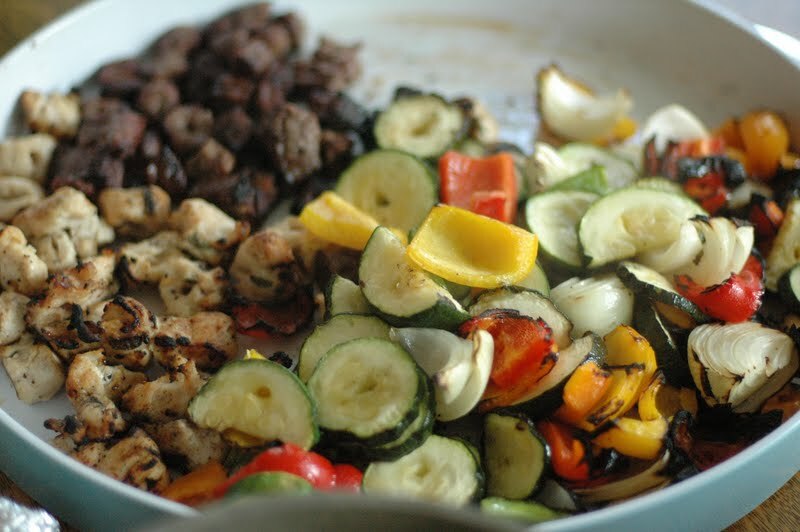 Grill veggies until tender. I like to serve with a rice dish. 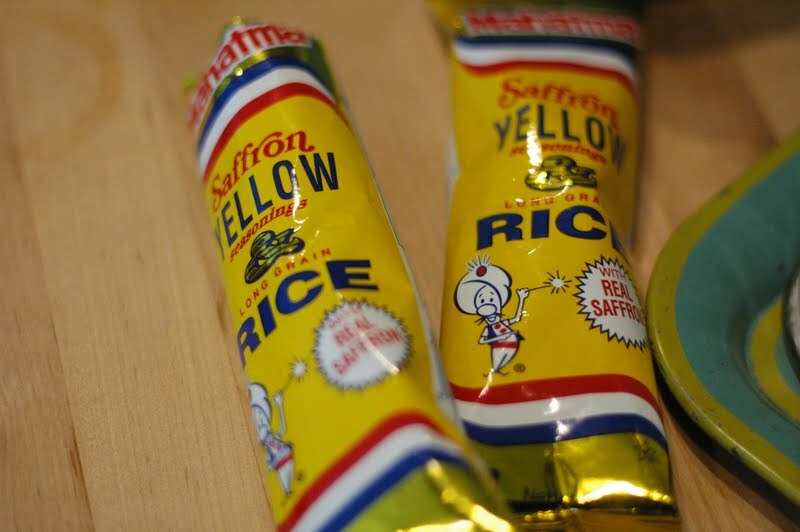 Our favorite fast and easy and tasty is the Saffron Yellow Rice. I also like to serve a green salad with this meal. 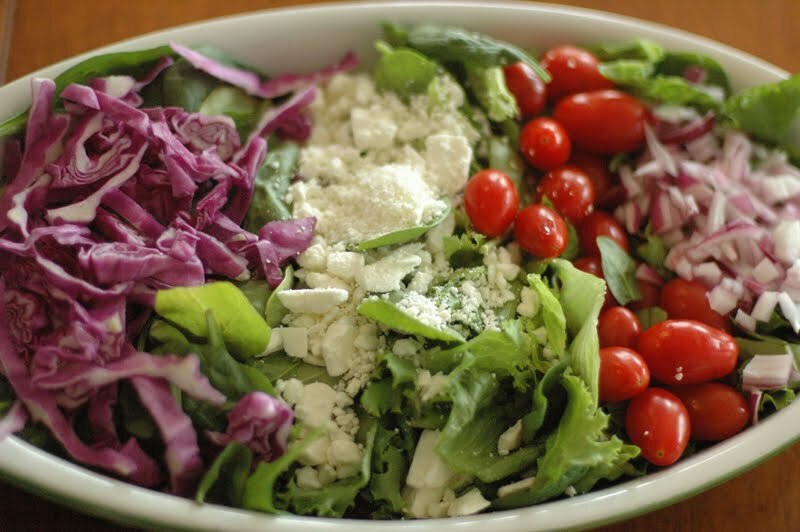 Last week we made a Greek salad and I loved scooping up the rice, salad and kabob with the Greek dressing and the Tzatziki sauce. For my Greek Salad, I included Romaine Lettuce, Shredded Purple Cabbage (from my mom’s neighbor’s garden), grape tomatoes, diced red onion and Feta (of course). I would have included cucumbers, olives and banana peppers if I had had them that day. 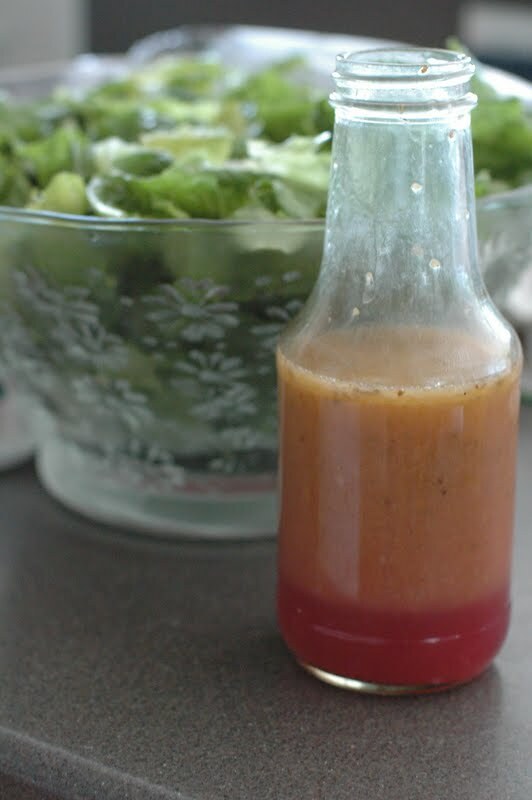 The dressing is super simple and tasty! Stir together all ingredients except oil. While whisking vigorously, slowing pour in oil until well incorporated and thick. Blend or process, refrigerate, and serve cold. Refreshing and delicious! In a saucepan over medium heat, combine coconut milk, peanut butter, onion, soy sauce, brown sugar, and pepper flakes. Bring to a boil, stirring frequently. Remove from heat, and keep warm. yum!!! can we have a kabob party soon? ?